* Title: Jerusalem * Publisher: Doko Media * Format: NTSC/DVD * Subtitles: English/Spanish/German * Region: 1 * Number of discs: 1 * Studio: The History Channel * Run Time: 60 min. Why is Jerusalem so unique? What secrets lie beneath the Old City's homes and shops and narrow alleys? What mysteries still lie hidden far from tourists' view? And why, of all the places on earth, has Jerusalem been singled out to become the Holy City and the spiritual center of the three Western World's major religions: Judaism, Christianity and Islam? To answer these questions, we invite you to walk the footsteps of Abraham, who came to Mount Moriah - the Temple Mount, ready to Sacrifice his only son to God. Witness what the city was like during Great Kings, David and Solomon, who designed and built Jerusalem's great Temple. Follow the pathways of the Father of Christianity, Jesus, as he walked and spread his message from this city to the world over and took his last journey along the Via Dolorosa as he was led to Crucifixion on Golgotha. See where Mohammed, as detailed in the Koran, ascended to Heaven from the Dome of the Rock in the Noble Sanctuary. 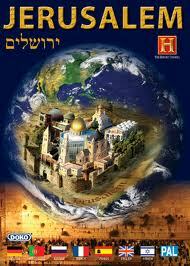 Join us in this Spiritual Movie and discover the roots and the three great Monotheistic Religions of the world.